How do you want to be remembered through all eternity (or at least until the sun explodes)? What you have put on your tombstone is pretty much the last chance you'll have to spin your story. When I walk through a graveyard (and yes I do, because I'm a bit morbid) my sole impression of the person beneath my feet is whatever somebody put on their marker. It's sort of like those crucial "first 4 minutes" when you form your opinion of a stranger, which thenceforth is written in stone and can never, ever change. Unless you're a famous or profitable person, I most likely wouldn't find you on Wikipedia either, even if I thought to look. They have "notability" rules, you know. "You gonna remember the d*** name, I give a f*** if I die with no d*** friends, I got my fam by my side and that's until the end"
Fortunately or unfortunately for the thriving rap world of 200 years from now, when the Pine Grove Cemetery reviewed the designs they rejected the lyrics. 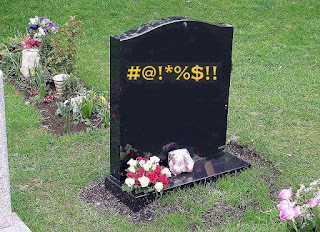 Luckily, the expensive gravestone hadn't been engraved yet. Uno's family was cooperative and selected a new, profanity-free verse from his repertoire. No word yet on how that one goes. Personally, for my epitath I'm torn between "Man that is born of a woman is of few days, and full of trouble." (Job 14:1), "Friend of the worms," or "Hey, check out my blog at www.AFewParagraphs.com !"